XXXIII.40, 42, 46-47, 50, 52-60; Tatian's Diatessaron (c. 150-160). "Those men are often the cruellest enemies of the Church, to whose faithfulness it is committed: But the vocation of God is neither tied to time, place, nor person." "The unbelief of sinners will be their ruin. But God has many ways of restraining the remainders of wrath, as he has of making that which breaks out redound to his praise." "Stumblers at Christ shall even then receive much hurt. He is said to fall on this stone, who hears the Gospel and does not believe." "These details are taken, as is the basis of the parable itself, from that beautiful parable of Isa 5:1-7, in order to fix down the application and sustain it by Old Testament authority." "The "corner-stone" joined two walls. Alford thinks this is a reference to the union of Jews and Gentiles in the church." "In Words and Deeds," David Lose, ...in the Meantime, 2017. "Caring for the Kingdom of God," Karoline Lewis, Dear Working Preacher, 2017. "The Parable of the Vineyard: Being 'Tenants' Today," Janet H. Hunt, Dancing with the Word, 2017. "What Will He Do To Those Tenants?" Glenn Monson, Law & Gospel Everywhere, 2017. "Pissed Off Jesus," Casey Cross, Modern Metanoia, 2017. Commentary, Matthew 21:33-46, Emerson Powery, Preaching This Week, WorkingPreacher.org, 2014. "Proper care and oversight of those people and things entrusted to us should receive fair hearing from this parable. We, too, are like those who wish to receive more credit for our labor, as if we 'own' the 'land.'" "Crazy Love," David Lose, ...in the Meantime...2014. "...in this week's parable, Jesus, according to Matthew, plays off the familiar imagery of the vineyard and the unfaithful managers of the vineyard to score some serious 'gotcha' points." "Tending the Vineyard," Karoline Lewis, Dear Working Preacher, 2014. "God has bequeathed us the vineyard. God calls us to tending that is merciful and kind. God needs us to move from speech that is mere passivity and consolation to prophetic preaching that is about judgment and hope." "Resurrection: The Return of the Rejected," D. Mark Davis, Left Behind and Loving It, 2014.
" If one is hearing this parable as a judgment against imperial regimes who have overstepped their God-given purpose, then this is an act of hubris whereby those regimes are no longer rendering God's judgment but are trying to overcome God's own purposes." "The Vineyard and the Days of Awe," Nancy Rockwell, The Bite in the Apple, 2014. "We think we know what virtuous life is, and who decent people are. If only more power were ours, we could surely arrive at the sweet land of our dreams, where sorrow and sighing would flee away." "A Difficult Text to Preach: Ched Myers and the Parable of the Tenants," Michael Anthony Howard, The Pacific Pilgrim, 2014. Includes video of Ched Myers teaching about this parable. "...I will not be preaching that the wicked tenants in this passage refers to "the Jews." Instead, it will be an honest talk about Jesus' vision for the for a new community, our desperate need to learn the practice of repentance, and a continuation of last week's discussion about authority." "What If the Earth Was God's Vineyard?" Shanell T. Smith, ON Scripture, Odyssey Networks, 2014. Video: People of Faith March to Save the Planet. "U.N. Summit bottom line: We must take care of this world. Jesus' bottom line: We must take care of God's kingdom, which to many, is one in the same." "Blood Money," Sonja Olson, Question the Text, 2014. "What does the parable teach about how God loves or how we can fall or be crushed? Is there good news in both scenarios? When the landowner came to the tenants, did they receive the son's inheritance?" "Planning a Coup?" Bob Cornwall, Ponderings on a Faith Journey, 2014. "We who are preachers, are we willing to listen to new voices, even as we seek to safeguard the tradition passed down from generation to generation? What are the issues we need to wrestle with?" "To Which People?" Andrew Prior, First Impressions, 2014. "The church itself, our congregation, is called to be a people who bear fruit. If we do not, even though we are 'a church,' we are on the side of the chief priests and the Pharisees." "God's Vineyard," Janet H. Hunt, Dancing with the Word, 2014. "How do you hear Jesus' parable today? Does the fact that he paints such an extreme picture make it easier or more difficult to apply to your life?" "Vengeance?" Alan Brehm, The Waking Dreamer. "This world operates on the basis of do unto others as they have done unto you, just like the characters in the parable. But the "Kingdom of Heaven" operates on a very different basis: on the basis of God's grace, God's unconditional love, and God's unfailing mercy." Evangelio Comentario del San Mateo 21:33-46 por Javier Ortega Badilla, Working Preacher, 2014. Commentary, Matthew 21:33-46, Sharon H. Ringe, Preaching This Week, WorkingPreacher.org, 2011. "This parable does not use the story to set forth the surprising nature and qualities of God's reign, as do so many others in the Gospels. Its focus is rather on the futility of debates about, and maintenance programs for, the institutions of this age." Parable of the Wicket Tenants, audio telling, story in episodes, graphic, audio and written commentaries. Go Tell Communications, Biblical Storytelling for the Global Village, 2011. Holy Textures, Understanding the Bible in its own time and in ours, Matthew 21:33-46, David Ewart, 2011. "Who, ACTUALLY, is producing the fruit of the Kingdom? It could be the religious leaders. Nay. It SHOULD be the religious leaders. But are they? Are we?" "It Never Quits," Fr. Rick Morley, a garden path, 2011.
Who Are the Wicked Tenants? Alyce M. McKenzie, Edgy Exegesis, Patheos, 2011. "Roman Catholic teacher of preaching Ken Unterer says that's like going into a haunted house without a flashlight. And, he says, "don't make a habit of following a moving story with an explanation. Many times, it is more effective to just sit down and let listeners apply it to themselves." Commentary, Matthew 21:33-46, Ira Brent Driggers, Preaching This Week, WorkingPreacher.org, 2008. "A question I've heard asked, but not answered fully is: "How could the tenants possibly inherit the vineyard?" It would seem quite presumptuous to think that by killing the owner's son that they owner would give them the vineyard. Perhaps they assumed that the owner was dead when they saw his son. It's not that long ago that "God is dead" was a popular slogan. Whether these tenants thought that or not, they acted as if God/landowner were dead." "First Thoughts on Year A Gospel Passages in the Lectionary," Pentecost 17, William Loader, Murdoch University, Uniting Church in Australia. "Loving is a challenge we often savage or sabotage, whether at a personal or a community level." "The Wicked Servants," Gospel Analysis, Sermons from Seattle, Pastor Edward F. Markquart, Grace Lutheran Church, Seattle, Washington. Detailed background and exegesis. "The tree looks healthy but it is not. A religious life looks healthy but it is not. A Christian can use all the right buzz words, read the Bible, attend church and do all the churchy things but lives a lie and does not demonstrate the love of Christ in daily actions." Dylan's Lectionary Blog, Proper 22. Biblical Scholar Sarah Dylan Breuer looks at readings for the coming Sunday in the lectionary of the Episcopal Church. "Jesus? parables aren't there to make complicated truths simple, but to complicate what seems to us to be simply true." "Matthew 21:33-43, Pentecost 20 (Reformation Sunday)," Perspectives on the Parables -- Glimpses on the Kingdom of God, Robert H. Albers, Word & World: Theology for Christian Ministry, Luther Northwestern Theological School, 1984. Wellspring of the Gospel, Ordinary 27A, Catherine McElhinney and Kathryn Turner, Weekly Wellsprings. "Intimidation, Violence, Retribution," Larry Broding's Word-Sunday.Com: A Catholic Resource for This Sunday's Gospel. Adult Study, Children's Story, Family Activity, Support Materials. "When is the use of violence justified?" 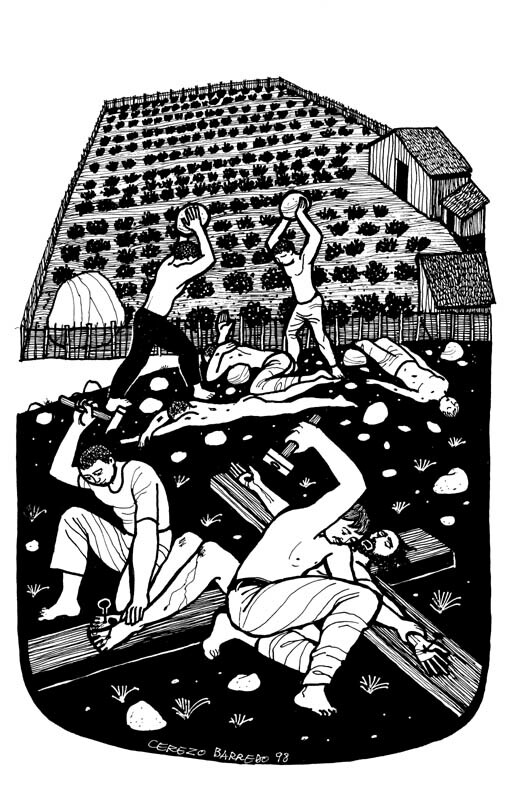 "The Parable of the Cruel Vinedressers," George Lyons, Wesley Center for Applied Theology, Northwest Nazarene University. "The Tenants in the Vineyard," Rev. Bryan Findlayson, Lectionary Bible Studies and Sermons, Pumpkin Cottage Ministry Resources. Includes detailed textual notes. "...the colourful gamut of interpretations that sprang from the Hebrew text of Isa 5,1-7 not only influenced the genesis of Mark 12,1-12 but also the way in which the parable was adapted by Matthew at a later phase of the tradition." "'O Jerusalem, Jerusalem,' The Holy City," Peter Walker, Sojourners, September/October 2000. "Belief in the city's holiness has sometimes been used to legitimate unholy action." Culbertson, Philip L., "Reclaiming the Matthean Vineyard Parables," Encounter, 1988. Grindal, Gracia, "Missing the Point," The Christian Century, 2002. Kingsbury, Jack Dean, "The Parable of the Wicked Husbandsmen and the Secret of Jesus' Divine Sonship in Matthew: Some Literary-Critical Observations," Journal of Biblical Literature, 1986. Lovette, Roger, "Dinner Reservations," The Christian Century, 2005. Newell, Jane E., and Raymond R. Newell, "Parable of the Wicked Tenants," Novum Testamentum, 1972. Reid, Barbara E., O.P., "Violent Endings in Matthew's Parables and Christian Nonviolence," The Catholic Biblical Quarterly, 2004. Turner, David L., "Matthew 21:43 and the Future of Israel," Bibliotheca Sacra, 2002. "Trouble at the Festival," the Rev. Dr. Dock Hollingsworth, Day 1, 2014. "The Rental Fruits of God's Vineyard," 20 Pentecost - 2 October 2005, Hubert Beck, Göttinger Predigten im Internet: Every Sunday Sermons based on the RCL by a team of Lutheran theologians/ pastors. "The Wicked Servants," Sermons from Seattle, Pastor Edward F. Markquart, Grace Lutheran Church, Seattle, Washington. Worshiping with Children, (World Communion Sunday) Including children in the congregation's worship, using the Revised Common Lectionary, Carolyn C. Brown, 2014. 2011. "Storypath Lectionary Links: Connecting Children's Literature with our Faith Story," October 5, 2014, Union Presbyterian Seminary. Connections: Exodus 20:1-4, 7-9, 12-20 and Sadie and the Big Mountain by Jamie Korngold, The Secret Lives of Men and Women: A PostSecret Book by Frank Warren, Matthew 21:33-46 and The Ugly Duckling by Hans Christian Anderson. "Last of All, He Sent His Son," Charles Kirkpatrick, Sermons4kids.com. "Wicked Tenants Steal from the Owner," Sunday School Lessons: Family Bible Study, art projects, music, stories, etc. "The Parable of the Evil Vinedressers," children's study, puzzles, coloring sheet, etc. Higher Praise Christian Center. "The Vineyard of the Lord," from A Certain Jesus by Jose Ignacio and Maria Lopez Vigil. Ideal for catechetical and liturgical dramatization of today's gospel. Claretian Publications. Clip Art, Matthew 21:42, Fr. Richard Lonsdale, Resources for Catholic Educators. Clip Art Images: Matthew 21:33-43, Misioneros Del Sagrado Corazón en el Perú. Matthew 21:33-43, at Cerezo Barredo's weekly gospel illustration. Liberation emphasis. Matthew 21:33-46, Scripture Pics - graphics relating to RCL texts, Matt Baker, Germantown UMC, Ohio. Hymns with Scripture Allusions: Matthew 21:41. The Cyber Hymnal.